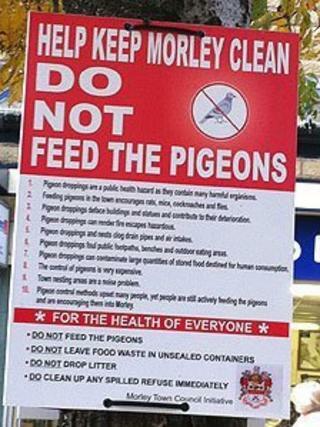 The Pigeon Control Advisory Service told the BBC that culling "causes the birds to rebreed". "We are not throwing away our rubbish properly and we're feeding them over and above what they need," said Emma Haskell, of the Pigeon Control Advisory Service. "The key message is to stop feeding them." Ms Haskell said that in the USA, contraceptives were fed to birds to control their population, but they were not used in the UK because contraceptives had not been proven to be an effective method of control. Elsewhere in the UK, councils have used birds of prey to keep the pigeon population at bay, but Ms Haskell said this was not recommended either. "The peregrine falcon is the pigeon's natural predator, not the Harris hawk which is commonly used," she said. "Pigeons fly a lot faster than the Harris hawk and it will only ever catch young, injured or sick pigeons. "There was outrage in Norwich when a Harris hawk flew down and ate alive a pigeon in the middle of the town centre. It was all very upsetting."